Senecio lamarckianus (Bois de Ch�vre). These are small well-branched bushes that can reach 2 to 3 m in height. The stalks have dense white tomentum. The leaves are petiolate with an elliptical lamina measuring 11 to 13 cm in length by 3 to 5.3 cm in width. They are also rather pointed at the tip and slender at the base, quite serrate at the tips and silvery greenish in colour. 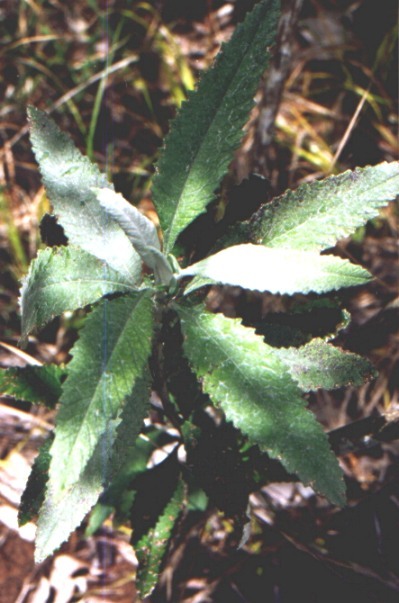 The leaves also have dense white tomentum above, and petioles measuring between 1 and 2 cm, which bear small, well-spaced lanceolate lobules, are found on opposite sides. Capitula are dense, numerous and radiate as terminal, compound corymbform cymoses. The inflorescence too is wholly covered by tomemtum. Campanulate involucres are bracteate and occur in groups of 7. They can measure between 3.2 and 3.8 mm. The flowers are yellow and spread out by a radius of 2.8 mm. A long tube of 2 mm is also present. Achenes can vary between 1.2 and 1.8 mm in length, are smooth and bear a deciduous pappus of 2.7 to 3 mm long with white hairs.